There are many wonderful reading programs on the market that teach phonics or decoding in a variety of delightful and helpful ways. If your child struggles with reading fluency or decoding, I would strongly encourage you to investigate a multi-sensory approach in order to teach these skills. * In the meantime or to supplement your current program, try this fun story and mnemonic device to introduce the vowels and their "short" sounds (which I concocted and successfully used years ago as a young teacher in southern Ohio). the letters A, E, I, O, and U - no "sometimes Y" today (use magnetic letters, letter tiles either homemade or store bought, or something similar). If making them yourself, you may write upper case letters on one side and lower case on the other so the child sees both forms. If you include your child in creating the tiles, you will have succeeded in integrating fine motor skills including cutting and handwriting into the lesson. Remember - the goal is not a slick, packaged look but a quick, inexpensive, and functional learning activity (with the emphasis on activity). a container to act as the roller coaster car (this could be a small box, food storage container, etc.) 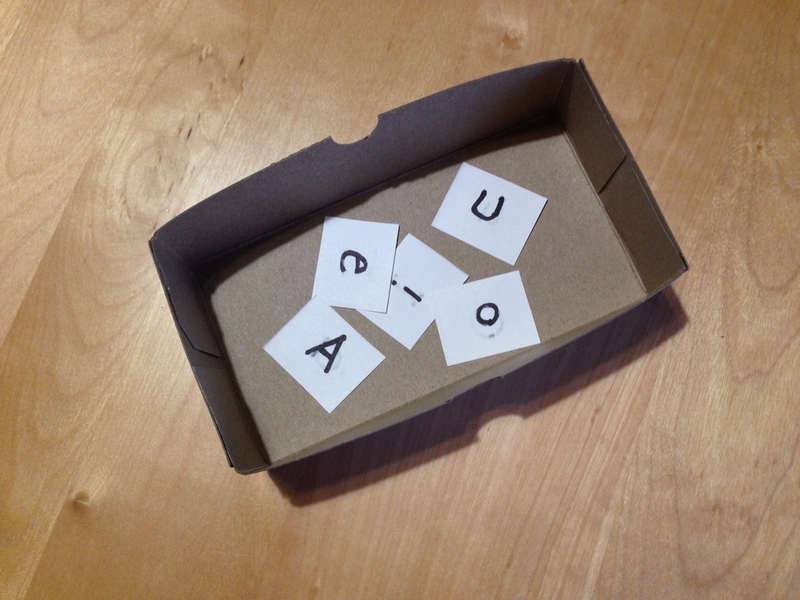 that can also serve as a way to store the vowels for use later. One day the five vowels, A, E, I, O, and U, went to an amusement park (you can insert the name of a park your child knows or substitute the word "fair" for "amusement park"). They stood in line for some time to ride the roller coaster (again, insert the name of a favorite one here if you like), and when they finally got to the front of the line, all five of them piled into one car (have all letters in the box at this point). As they were going up the first, steep hill (pick up the letter O, and either move him upward on the drawing or in the air), Short O began to moan, (at this point, make the short /o/ sound as if you're very nervous) and all the other vowels looked at each other with frightened faces (act this out). No sooner had the car reached the top, than it came crashing down the slope and Short A could be heard screaming (now with A in hand and moving it downward, loudly make the short /a/ sound, holding the sound until you reach the bottom of the hill). With a thud, the car hit bottom, and (pick up U) Short U's stomach did a flip-flop. "Uh!" he grunted (grab your stomach as if you just got punched there). Just as quickly, the car sped onward and upward over a little cherry bump and Short I cried (with I in hand, make the short /i/ sound as if in surprise). By now, all the vowels were exhausted, and as the roller coaster car slowed and headed back on a straight path to the depot, (move E slowly toward the finish) Short E breathed a sigh of relief and softly whispered, "Ehhhhhhh." Be as dramatic as possible, and encourage your child to participate in telling the story. Make sure he/she knows the hand movements that replicate the roller coaster ride so they can be used later as cuing devices. The sillier you are, the better - and don't forget the laughter! Keep in mind, this is only one of countless ways to provide scaffolding for children while they learn this skill. I'd love to hear other ways you have done the same!